Take this article on WUWT today (archived here). By my count Anthony Watts has now posted more than twenty articles about the Australasian Antarctic Expedition, which means that to science deniers it's almost as significant as scientific papers - Marcott13, Cook13 and Lewandowsky12. Will global warming alarmists ever set aside their hypotheses, hyperbole, models and ideologies long enough to acknowledge what is actually happening in the real world outside their windows? Will they at least do so before setting off on another misguided adventure? Complaining that they do get out in the real world to see what is happening. Paul goes to great lengths about how people shouldn't take risks, but at the same time expects scientists to either know or find out about conditions in dangerous parts of the world. And seems to think it was fine for people long ago to take risks. Science deniers are seriously illogical. Paul also tells a few fibs along the way - like the one Anthony Watts told - how he claimed to give the Expedition a weather forecast - when Anthony did no such thing. He and 51 co-believers set out on the (diesel-powered) Russian charter ship Akademik Shokalskiy to prove manmade global warming is destroying the East Antarctic ice sheet. provide baseline data to improve the next generation of atmospheric, oceanic and ice sheet models to improve predictions for the future. Despite steadily rising atmospheric carbon dioxide levels, average global temperatures have been stable or declining since 1997. Wrong! In fact, except for 1999 and 2000, every one of the sixteen years since 1997 has been hotter than 1997. And the surface temperature is definitely not declining. Sure - but it took Amundsen two years or more in a shallow bottomed boat hugging the shoreline to make it through the passage. It's different these days. Now there are large commercial ships that can get through the Arctic in a few days, because there is much, much less ice in summer. The fundamental issue is this: Are humans causing imminent, unprecedented, global climate change disasters? And can we prevent those alleged disasters, by drastically curtailing hydrocarbon use, slashing living standards, and imposing government control over industries and people’s lives? 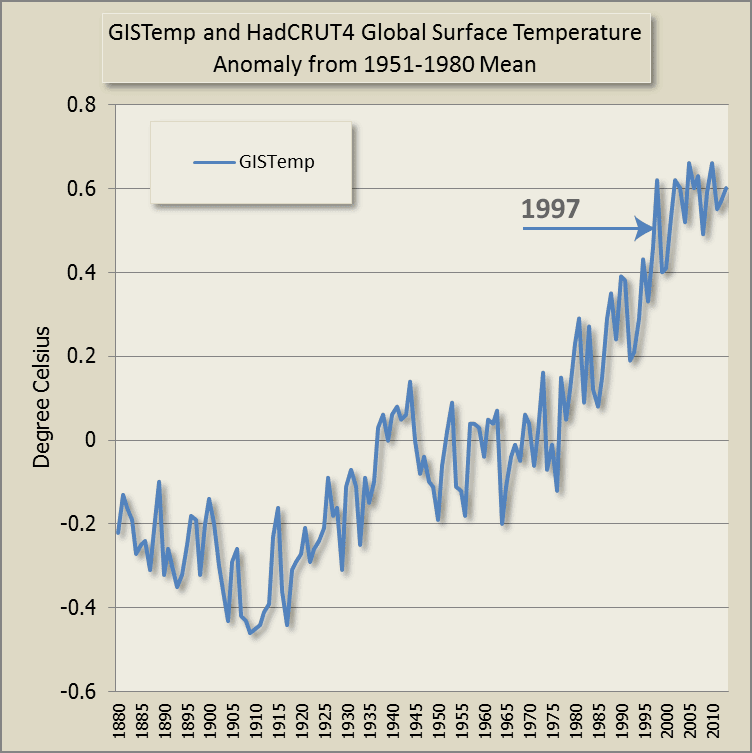 If you look at actual evidence – instead of computer model forecasts and “scenarios” – the answer is clearly: No. Are humans causing imminent, unprecedented, global climate change? Yes. Can we limit the extent of climate change? Yes, by cutting CO2 emissions. If we don't take action, will there be consequences? Yes - seas will rise a lot, large areas of earth will become uninhabitable because of periods of temperatures too hot to handle, food production will suffer, species will die out etc etc. People like Paul Driessen who earn a living by rejecting science are too transparent. They work for their paymasters not for society. That's clear from the evidence of the lies that they tell. Anthony Watts is quite happy to promote their disinformation. He doesn't have the well-being of humanity in mind either. Only his ideology, advertising revenue and blog hits, and whatever dollars he can beg from his loyal denier base. "By my count Anthony Watts has now posted more than twenty articles about the Australasian Antarctic Expedition"
When scientists who promote global warming have their ship trapped in polar ice in the summertime, you have to expect more than average coverage of the story. This is not something unique to WUWT.. the entire blogosphere has been making the most of this ironic spectacle. Whether you like it or not, Turney's summer of angry ice will become legendary in the sceptical community. Indeed. Deniers can't help looking dumb and petty. They have no grounds for rejecting the science so they are forced to hash, flog and rehash the same tired denier memes over and over again and then repeat. This week WUWT even revisited the stolen emails. It's four years or so since deniers were found to be barking up the wrong tree on that score. Science deniers haven't been able to fabricate fresh myths in years unless you count Russian steam pipes causing global warming, or sudden outbreaks of UHI disease at remote airports. I guess they picked on this particular ship rather than other ships and ferries that have been trapped by ice in recent years because it carried a scientific expedition. So predictable, that lot, aren't they. I like it, because the revisionist community will systematically miss out on the reality of the thing. The days before the ship got stuck were very warm in that area. Then, from 23rd to 27th: hovering about normal. Then, while other ice breakers were getting problems, new 'heat' there rising to anomalies of +10° C or over. Apart from from a cooler day 2nd of January that continued first week of the new year. Revisionists will never look at this. Too inconvenient. Too hard on the hare brains to understand something about, e.g., wind, ice pack let alone Ekman. Or why there is a bit more sea ice around Antarctica in the first place. I don't doubt the "summer of angry ice" will become legendary in denier circles, just as SlimeItGate and the Broken Hockey-Stick have. And, indeed, as Watts has. In other circles the Protocols of the Elders of Zion is similarly legendary. "Mythical" is more appropriate, except for Watts, who is, believe it or not, a real person. If you are after irony, you could do no better than to look at Watts Surfacestations Project, or his unqualified acceptace of the BEST Project results, at least until they provided results he didn't want to hear. Irony arises when events are the opposite/contrast of expectations. If the expectations of WUWT are derived from ignorance, I guess you could call it irony. I'm happy to put a name to my comments. Perhaps the owner of this blog could follow suit? I was amused to see that in trying to de-bunk a comment about the lack of warming since 1997, you use a graph which shows plenty of warming since 1880. 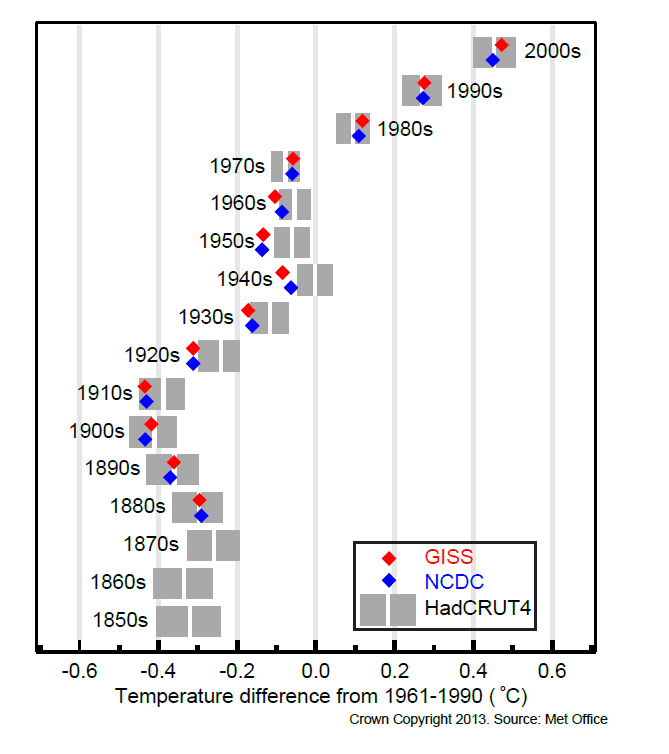 In fact, the 2 datasets you use in your illustration show warming of 0.07 and 0.04 deg C/ decade since 1997. Whether or not such a precise level of warming is exactly caused by the planet's 6 billion human beings, it hardly represents "catastrophic" warming, and can rightly be described as "stable". Not many 17-year periods have a smaller trend, either up or down, unless you carefully select them by looking at the graph. Mr/Ms Barraclough, your name means nothing to me. If we've met I don't recall the occasion. Welcome to HotWhopper. You may call me Sou. Or Ms Sou if that makes you less uncomfortable. Your opinion about global warming is noted. Misguided, not consistent with science, but noted. By the way, I suggest in future you use the Oxford English definition of this word. Or in another context, there is this. "Not many 17-year periods have a smaller trend, either up or down, unless you carefully select them by looking at the graph." Hilarious - who is doing the cherry picking R?